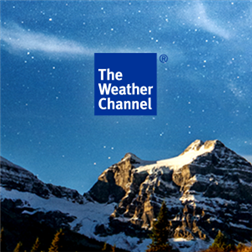 A new The Weather Channel® App for Windows Phone is for true weather enthusiasts who want a full view of the weather with The Weather Channel. The app has been updated recently with new design and interface that make it easy to use. A new social feature lets you report your local conditions – you help improve the forecast. The app is now available from the Windows Phone Store. New live tile – Opt for a live tile to follow you for current weather wherever you are, or also select specific locations to keep tabs on their conditions. 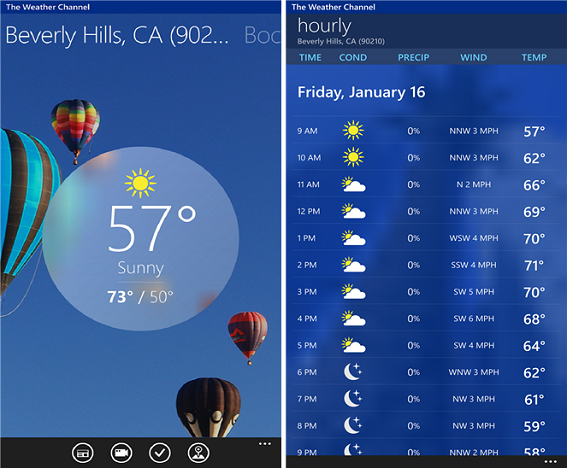 Find weather faster – A beautiful new design and simple interface makes the app easy to use. Smoother radar maps – The radar map loads faster and more smoothly, with past and future radar and map layers such as cloud, radar, water temperature, wind speed, snow cover or more. You can also active hurricane tracking and view severe weather alerts for storm tracking or tornado activity. Discover deeper, more engaging content – With improved navigation, swipe sideways for your saved locations. A vertical scroll unveils current conditions, hourly and 10-day forecasts, radar, video, news and more. Get the info you need – Get in-depth current details, such as “feels like” temperature, wind, dew point, humidity, visibility, pressure, UV index, and sunrise and sunset times. Also find a 36-hour summary, hourly details out to 48 hours, and a 10-day forecast. Become your own weather forecaster – Introducing Social Weather on Android, the app lets you report and share your weather conditions or see what others in your area are saying about your current weather. Help improve the forecast – With Social Weather reports, you can help find and improve the forecast for hard-to-predict spots. The Weather Channel includes data points from proprietary models, official government sources worldwide, Weather Underground’s network of 60,000+ personal weather stations, and now crowd-sourced weather reports via mobile app. Prepare for pollen, no matter the season – Keep up with the latest pollen counts and information, including direct pollen alerts available. Plan for ski season – Get powder reports, lift schedules and more with the ski report for relevant nearby resorts. Stay safe in severe weather – During extreme events, your entire app will change to tell you the full story. Be alerted when it matters most – Get notifications for severe weather and rain in your area, or high pollen counts in locations that matter to you. Get global language support – For the first time, The Weather Channel App for Windows Phone is available in 40 languages. Going beyond just a superior forecast, users can now also get the science behind the weather and the stories around it with the app, as well as multiple widget options for your home screen. The app still gives current conditions and forecasts you trust, past and future radar maps, severe Push alerts and badges for your area, the latest news and videos, and global language support. 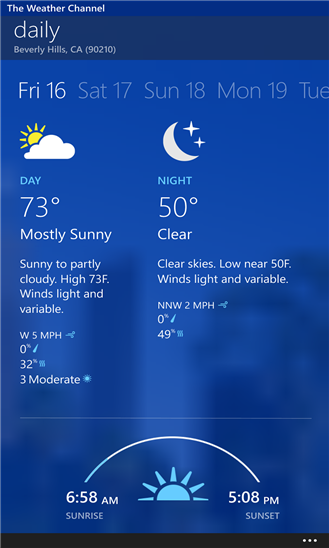 Let The Weather Channel App for Windows Phone help you plan your day. 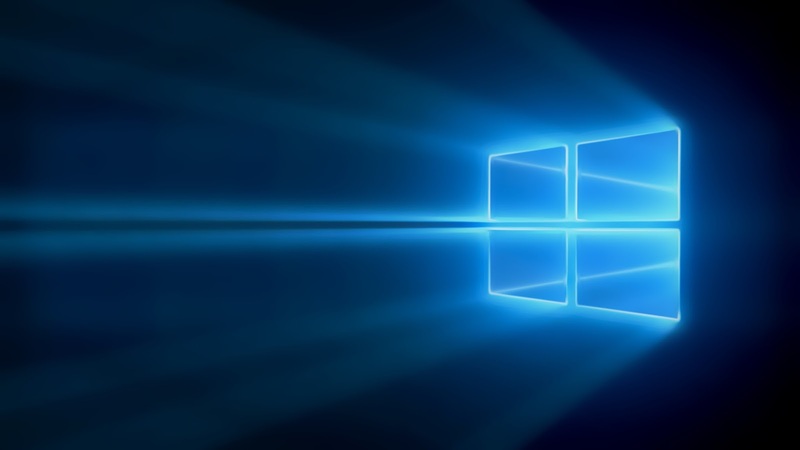 Check it out at the Windows Phone Store.